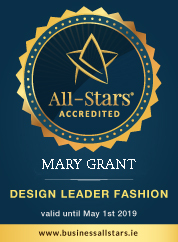 Mary Grant is a trading name of Grant Galvin Limited, a company registered inIreland. Our registered address is 15Milford, Athgarvan, Newbridge, Co Kildare.Our company registered number is 310019. Our VAT number is IE 6330019P. To use some of the services or features made available to you on this Site you will need to register. When you register you are required to provide information about yourself that is true, accurate, current, and complete in all respects. Should any of your registration information change, please notify us immediately at the following e-mail addresscustomercare@marygrant.com. We may also change registration requirements from time to time. The account password you provide should be unique and kept secure, and you must notify marygrant.com immediately of any breach of security or unauthorized use of your account. The site is available only to individuals and others who meet the marygrant.com terms of eligibility, who have been issued a valid credit/debit card by a bank acceptable to marygrant.com, whose applications are acceptable to marygrant.com and who have authorized marygrant.com to process a charge or charges on their credit/debit card in the amount of the total purchase price for the merchandise which they purchase. Marygrant.com reserves the right to restrict multiple quantities of an item being shipped to any one customer or postal address. By making an offer to purchase merchandise you expressly authorize us to perform credit checks and where marygrant.com feels necessary, to transmit or to obtain information (including any updated information) about you to or from third parties, including but not limited to your credit/debit card number or credit reports (including credit reports for your spouse if you reside in a community property jurisdiction), to authenticate your identity, to validate your credit/debit card, to obtain an initial credit/debit card authorization and to authorize individual purchase transactions. Marygrant.com offers products for sale that are in stock and available for dispatch from our distribution center. Occasionally however, we may be waiting for shipments of new lines. Consequently you may from time to time be given the possibility of making an Advance Payment for certain items in which case you are able to make an Advance Purchase. This will ensure that you receive this item in priority once the stock has been delivered to our distribution centre. Marygrant.com will only take Advance Purchase orders for stock that has been scheduled for delivery. Your rights regarding Advance Purchase are the same as those for any other purchase at marygrant.com. Alternatively, you may simply choose to register your email address for notification of arrival of the selected merchandise not held in stock. Mary Grant is happy to offer a Sale Price Adjustment on full price items purchased up to 7 days prior to the commencement date of a sale. Please be aware that the exact style and size of an item must be available for purchase at the time your request is made before any adjustment in the sale price can be approved. All approved Sale Price Adjustments will be credited to your marygrant.com account in the form of a store credit which will be valid for 12 months. Unless you cancel your order, acceptance of your order and completion of the contract between you and marygrant.com will be completed when we email you to confirm the goods have been dispatched. The sale contract is therefore concluded inIrelandand the language of the contract is English. Payment can be made by Visa, Visa Electron, Visa Debit, Visa Delta, MasterCard, Maestro debit cards, and any other methods which may be clearly advertised on the Site from time to time. Payment will be debited and cleared from your account upon dispatch of your order by marygrant.com. You confirm that the credit/debit card that is being used is yours or that you have been specifically authorised by the owner of the credit/debit card to use it. All credit/debit card holders are subject to validation checks and authorization by the card issuer. If the issuer of your payment card refuses to authorize payment to marygrant.com, we will not be liable for any delay or non-delivery. marygrant.com will store a record of your transactions for a minimum of one year. Gift vouchers can be redeemed against all products on the www.marygrant.com site. If your order exceeds the value of the gift voucher and you have existing store credit on your account, this will automatically be redeemed to cover the remaining balance. All remaining balances exceeding the value of your gift credit or store credit must be paid by credit or debit card. Virtual gift vouchers will be e-mailed to the recipient once the full order has been processed and payment has been taken. A copy will also be sent to the sender as confirmation of dispatch. Mary Grant is not liable for delivery of a virtual gift voucher to an incorrect or non-existent email address. This is the sole responsibility of the purchaser. Mary Grant is not responsible if a gift voucher is lost, stolen, destroyed or used without permission. Mary Grant reserves the right to cancel a gift voucher if we deem such action necessary. Sales tax and shipping is applicable on any products purchased with a marygrant.com gift voucher. Shipping charges are applicable on printed gift vouchers. Promotion codes may not be used to purchase gift vouchers. Marygrant.com insures each purchase during the time it is in transit until it is delivered to your specified delivery address. We require a signature for any goods delivered, at which point responsibility for your purchased goods passes to you. If you have specified a recipient who is not you for delivery purposes (for example as a gift) then you accept that evidence of a signature by them (or at that delivery address) is evidence of delivery and fulfilment by marygrant.com, and transfer of responsibility in the same way. Please note that we aim to dispatch all orders within 48 hours, or 72 hours during sale periods. Estimated delivery times are to be used as a guide only and commence from the date of dispatch. Marygrant.com are not responsible for any delays caused by destination customs clearance processes. If you are based in the EU under the Consumer Protection (Distance Selling) Regulations 2000 (DSRs), you have the right to cancel your order with us provided you give us written notice. Notice can be given any time after your order has been placed, up until 7 working days from the day after you received you order. Notice of contract cancellation under the DSRs must be given in writing to: Notice of Contract Cancellation, Customer Care Department, 15 Milford, Athgarvan, Newbridge, Co Kildare, or by email to:customercare@marygrant.com. For orders cancelled under the DSRs, we will issue you with a full refund, less the shipping cost. However, you will need to return the entire order to us by secure means to ensure it reaches us in good condition, at your own cost. Cancelled orders should be returned to: Mary Grant, 15 Milford, Athgarvan, Newbridge, Co Kildare. All items must be returned following our returns instructions. All items must be returned unused and in their original condition, from the original delivery country. Please note you may only use your right to cancel the order under the DSRs if you give us formal written notice of cancellation any time after your order has been placed, up until 7 working days from the day after you receive you order, by email or post as described above, i.e. before requesting your RMA either by email to customer services or through your marygrant.com account. Please email customercare@marygrant.com if any of your purchases have been delivered without mary grant tags. Briefs, swimming costumes and bikini bottoms should be tried on over underwear, without removing the protective adhesive strip. Returns may not be accepted if this strip has been removed or if items are soiled, and will be sent back to the customer. Goods are faulty if they are received damaged or where a manufacturing fault occurs within six months of purchase. Items that are damaged as a result of normal wear and tearare not considered to be faulty. We have made every effort to display as accurately as possible the colours of the products which appear on marygrant.com. However, as computer monitors vary, we cannot guarantee that your monitor’s display of any colour will be completely accurate. Your use of the Sites and its contents grants no rights to you in relation to any copyright, designs, trademarks and all other intellectual property and material rights relating to the Content (as described in the Content section below), including marygrant.com software and all HTML and other code contained in this Site. All such content including third party trademarks, designs, and related intellectual property rights mentioned or displayed on this site are protected by national intellectual property and other laws and international treaty provisions. You are permitted to use the content only as expressly authorized by marygrant.com and/or its third party licensors. Any reproduction or redistribution of the above listed content is prohibited and may result in civil and criminal penalties. Without limiting the foregoing, copying and use of the above listed materials to any other server, location or support for publication, reproduction or distribution is expressly prohibited. However, you are permitted to make one copy for the purposes of viewing content for your own personal use. In addition to the Intellectual property rights mentioned above, “content” is defined as any graphics, photographs, including all image rights, sounds, music, video, audio or text on this Site. Marygrant.com tries to ensure that the information on this site is accurate and complete. Marygrant.com does not promise that the content is accurate or error free. Marygrant.com does not promise that the functional aspects of the Site or marygrant.com content will be error free or that this site, or the server that makes it available are free of viruses or other harmful components. We always recommend that all users of the Internet ensure they have up to date virus checking software installed.